Grey black, black grey – Flux. It seems that all I have been wearing lately is grey and black. Bright colors don’t inspire me as much as they did in the summer time; however, I’m liking it because I feel like I’m going back to my roots. My inner rock princess is dying to get out, and why not let her? So black and grey is what you get, yet again. I decided to build my weekend’s outfits based on the black & grey crop top that I introduced a few entries ago. I attended an electronic festival called ManseDance which was organized here in Tampere and since Thursday’s gig was all ambient, a relaxed outfit was in order. I went with the crop top and my acid washed jeans. On Saturday the crop top and black & grey theme continued. I decided to wear something a bit more partyish since DMX Crew was playing some good dance tunes. Can you imagine that this very Scandinavian looking dress had been hiding in the closet of my old room for a whole year? I guess I had worn it on some weekend when I was visiting my parents and just forgot it like that. Finding it again was a very pleasant surprise; it’s like I gained a whole new dress! This little thing is really comfortable and I feel like I could wear it with black jeans to make it less partyish if I wanted to. On Saturday I wore it as it is and when Ed DMX asked the audience to come and dance on the stage, the crop top came off (I got so hot). I literally partied my top off! Both outfits are great, but i prefer the last one, because of the red shoes i think !!! They’re really amazing ! How much did they cost ? Sugar-trick: Thanks! 🙂 I’m glad you like them too. 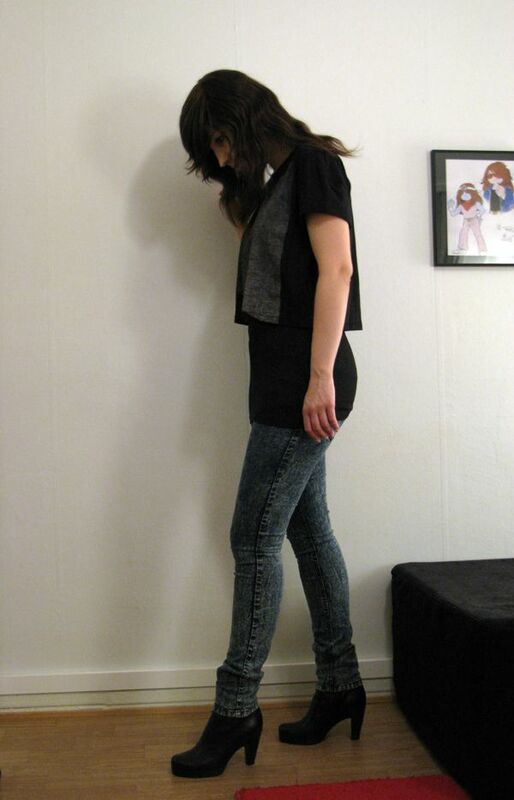 :)Estelle: The shoes cost about 80 euros but I got -10% off of them. They are from Stockmann. u wanted a pair for years!?!?!/! Noray: Kiitos! Olen myös rakastunut kivipestyihin. :)Snowshoe: Thanks! You should definately get yourself a pair then! These Cheap Mondays are.. well, very cheap! Söpö mekko, paljon söpömpi ilman päällystoppia! the Crop top is stuning! I realy love your hair! )do you curl it or it’s natural?